Mountainair  is a small town in Central New Mexico. It is most well known for being the home of the Salinas Pueblo Missions National Monument. Mountainair is located on the eastern side of the Manzano Mountains, separated from the rest of Central New Mexico. Mountainair is located on US-60 about 40 miles east of I-25. The intersection with I-25 lies between Belen and Socorro, about 50 miles south of Albuquerque. US-60 continues east into Southeast New Mexico, passing through Fort Sumner and Clovis. From the north, a more scenic (and longer) trip from Albuquerque is to take I-40 to Tijeras, then take NM-337 south to NM-55 south, which brings you into Mountainair through several small settlements. This route passes by the eastern side of the Manzano Mountains. +1 505 847-2585, . Summer hours 9AM-6PM daily, winter hours 9AM-5PM daily. Free. The Salinas Pueblo Missions are a series of ruins of several Native American villages and Spanish missions dating back to Spanish colonial times, which were later abandoned. The monument is composed of three sites: Abo, Quarai, and Gran Quivira. All three showcase the remains of impressive Spanish missions and the partially excavated Native American villages alongside them. All three sites also have a small ranger station and gift shop, where you can learn about the history of the site and purchase trail guides. Visitor Center, Mountainair. The headquarters for the park, the visitor center in the town of Mountainair has exhibits of various archaeological items from the ruins as well as park information. Abo Ruins, located 9 miles west of Mountainair, just off US-60. 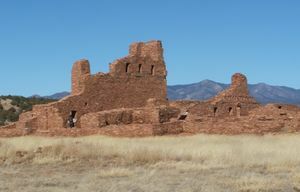 Abo preserves the remnants of a tall Spanish mission and the connecting structure, set against the scenic backdrop of the Manzano Mountains. A half-mile trail circles through some nearby mounds; the unexcavated remains of a pueblo. Quarai Ruins, located 8 miles north of Mountainair, just off NM-55. At Quarai is the most complete church in the whole monument - an impressive structure that towers above the visitor who walks through its remains. The half-mile loop trail also passes by unexcavated mounds and a small creek. A small museum is located at the ranger station. Gran Quivira, located 25 miles south of Mountainair, just off NM-55. Gran Quivira is the largest of the three sites; the remains of a pueblo village also known as Las Humanas. 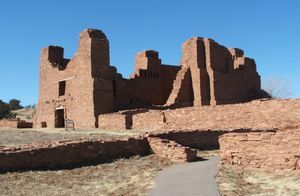 The half-mile trail loops through the large, partially excavated pueblo and through the ruins of two Spanish missions. The nearby Manzano Mountains offer opportunities for hiking, camping, and picnicking. The Manzano Mountains State Park , located north of Mountainair outside of the town of Manzano, offers camp sites and hiking trails. This page was last edited on 1 February 2009, at 01:56.